Why is Maxine Waters, the Dumbest Woman in Congress, not arrested by the FBI for threatening the president? Has she been investigated by the Secret Service for threatening the president as is their standard procedure? Why isn't Maxine Waters apologizing for encouraging others to harm the president? These questions need answers and a resolution because she has broke federal law and we have the proof. The American reports it’s been only four months since Rep. Steve Scalise was shot by a Bernie Sanders fan, but did one of his colleagues advocate violence against the president of the United States? 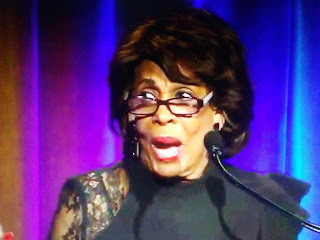 The one-note impeachment minstrel Maxine Waters promised a group that benefits “homeless LGBTQ youth” that she will “take out” the president — and the liberal audience wildly applauded. Appearing recently at the Ali Forney Center gala in New York City, it only took Waters 27 seconds before she slammed Trump.